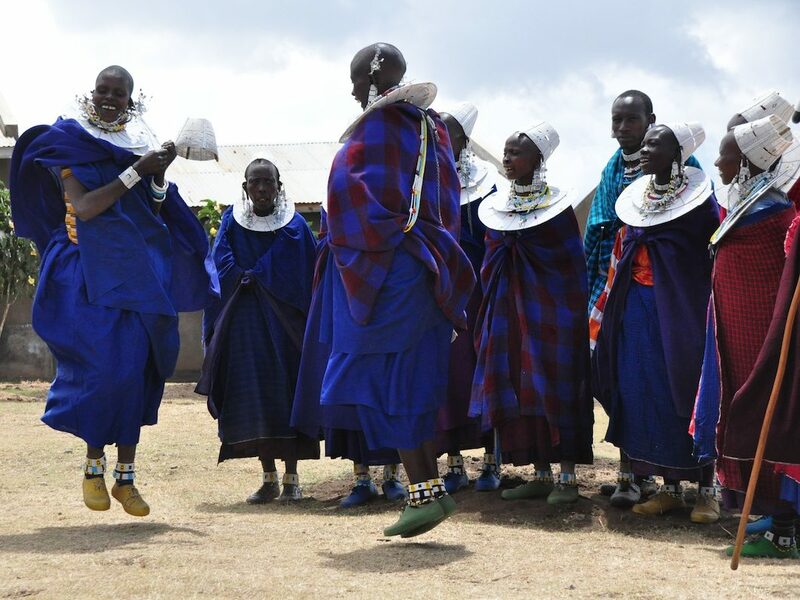 Maasai jump higher and higher either alone or with others, as their piers look on, during celebrations and ceremonies. 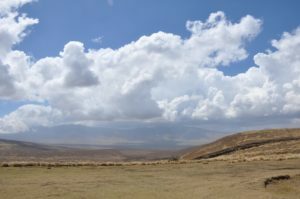 The subvillage of Sendui sits high above a sloping, expansive depression in the Ngorongoro Conservation Area near Alailelai. 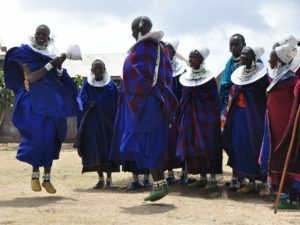 As in most Maasai villages of the same size, goat, cattle and sheep graze quietly on hillsides watched by their pastoralist owners, women cook or sit beading in groups and children help where they are needed or go to school if they can afford it. The only sound pervading this peaceful landscape when we visited recently was the tinkling of bells on the animals. 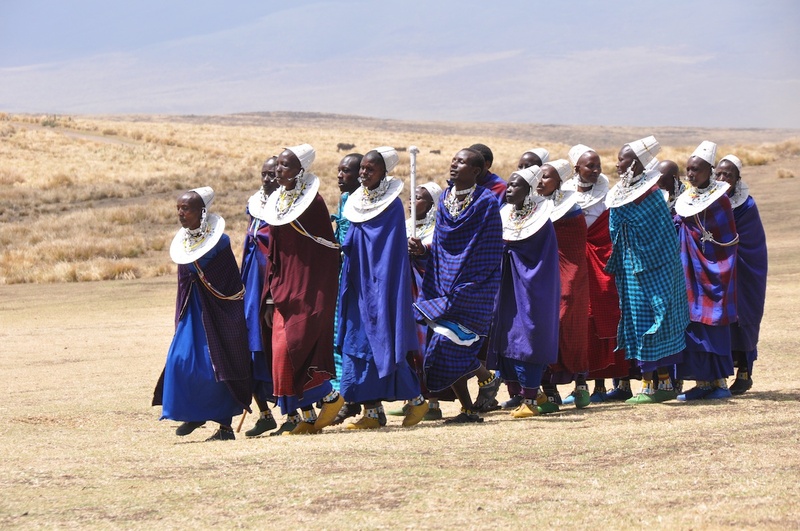 Eventually though, a dot of people in the distance grew with an increasingly loud song as a traditionally-dressed group of Maasai approached us, singing in thanks. They met and welcomed us at the school grounds with a long dance that included song and much jumping and yipping from everyone involved. The headdresses, collars, long earrings, bracelets and anklets, handmade by these women for significant life events, rang out jangling in soft and beautiful unison. Though grateful for the kindergarten MP built for them with funding from Sisters for Peace, the people of Sendui are desperate for a way to collect water. 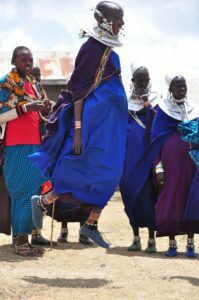 Dressed in traditional red and blue shuka cloths, the jewelry—primarily white beads accented with color here and there—served as a bright accent to these striking women and men and were incorporated into their dance. The ceremony was a celebration of thanks for MP’s most recent kindergarten, which was built here with the help of Sisters for Peace. Residents of Sendui want their children to have an education and asked for the kindergarten, so they were joyed at this new opportunity. But beneath the surface of celebration was a dark and pervasive crisis; the storm clouds gathering behind us promised so much but in the end brought little. This little village, so high up, does not have water. To the people here phrases like global climate change and la nina hold no meaning, but the concept is clear and present. Rains in this part of Tanzania are coming later and sparser and are not providing life-sustaining water for the people living there. In recent years rain has come much later in the season, started off light and ended too heavily. How can children attend school when there’s no water to drink, wash or cook with? How can anyone function under such circumstances? With edible vegetation browning out or not growing at all, and no water to drink, animals are simply dying. 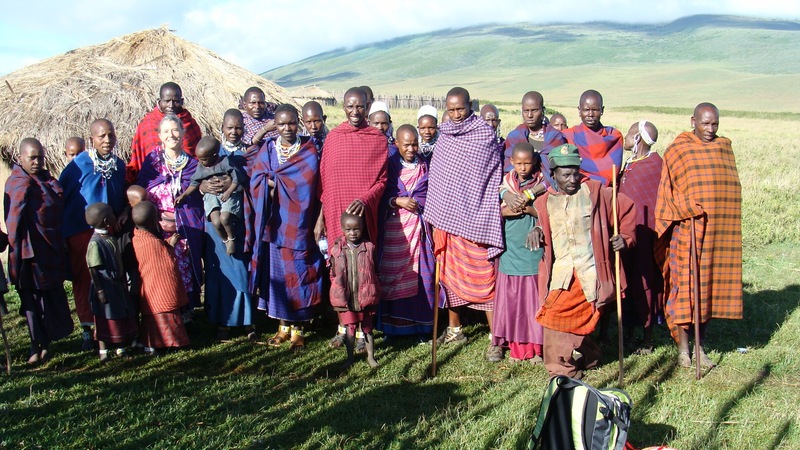 To the Maasai here, herds mean wealth at a social level but literally translate to life. Compounding their dwindling numbers with government restrictions at every turn has led to desperately difficult times. 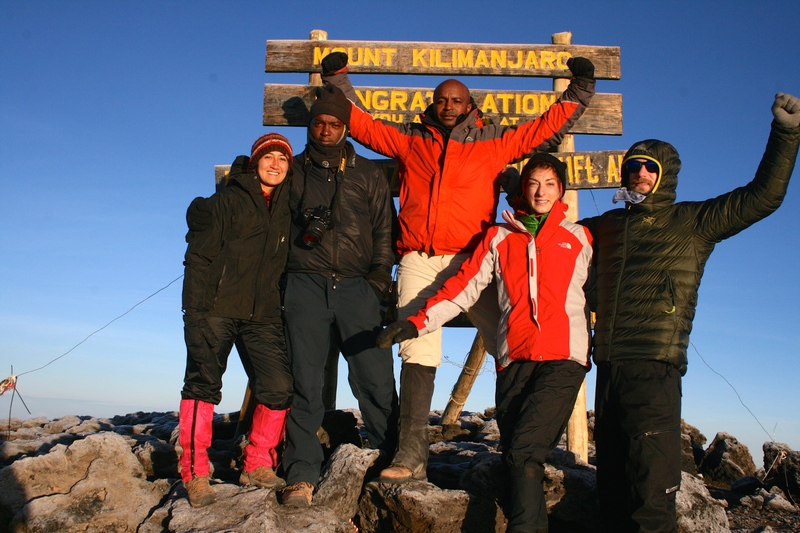 Amazingly though, they keep on smiling. 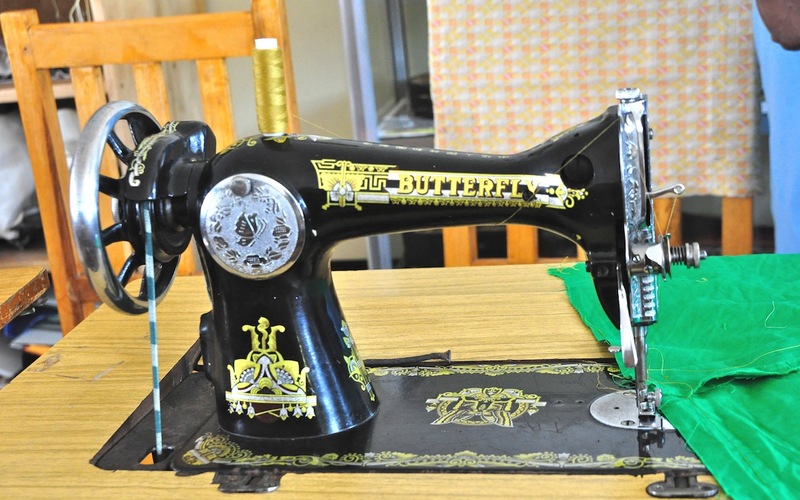 They sing, they dance and they ask for help when they have to. When it comes they are grateful, and when it doesn’t they do what they can to survive. 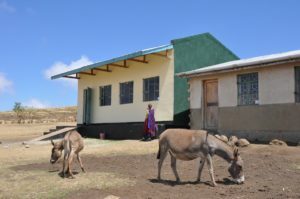 Members of Sisters for Peace visited the kindergarten they funded in Sendui; they then decided to help build a water cistern as well. 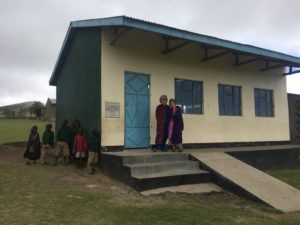 After joining MP in a visit to the kindergarten months after our celebration, Sisters for Peace saw the need for a solution to the water shortage agreed to work with us to bring a water cistern to this area through a grant. This will mean villagers in Sendui will have a way to collect whatever rain falls and have a stored source of water, which is a start in ameliorating the situation. When lack of rain turns this gorgeous landscape dry, there is no water for drinking, washing or nourishing the land. If you’d like to contribute toward another water cistern in Alailelai Ward, you can email us or donate here.